Swift Glass operates at the highest level of quality and efficiency. We are an ISO 9001:2015 certified manufacturer of quality glass parts to customer specifications. 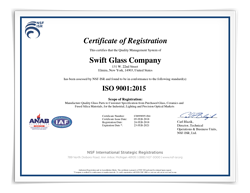 Swift Glass shares its ISO certificate with anyone who wishes to download and save it for their records. To access our ISO certificate, simply fill out the form to the right. Fill out the form to access the certificate.